In order to send email once a job completes, you will need to pre-generate the email which will be sent, and supply it as a text file. Use the workspace created in the previous section, and save a new copy of it. Add a Text File Writer in its place. The text_line_data attribute of the FMEServerEmailGenerator will connect to the input port of the writer. It can have an arbitrary path, since the path will not be used on the FME Server. The workspace can now be published. For this tutorial, we will be publishing to the Job Submitter service. Select the Job Submitter service for publication. 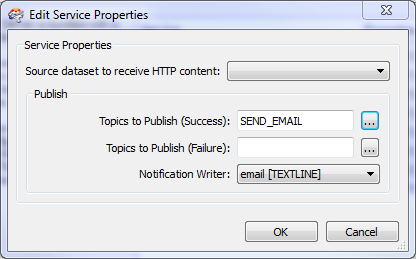 Edit its properties, setting “Topics to Publish (Success)” to SEND_EMAIL, and “Notification Writer” to the Text File Writer. Finish publishing, and run the workspace on FME Server. You should receive an email with your custom message. Troubleshooting for this section of the tutorial is mostly the same as for the previous section. In addition, ensure that the correct topic was chosen when the workspace was published, and that the notification writer was selected. In this part of the tutorial, we’ve configured a workspace to notify a user via email when it completes successfully. This can be useful to notify remote users of the completion of a long-running job, or notify an administrator when a database has been updated. In the next section, we will create email formatted with HTML.